I was riding upstairs with the elevator repairman, so I asked a question that needed to be asked. It was the Americans With Disabilities Act that disabled the door close button, in an effort to make sure those with crutches or wheelchairs could load safely. But people like to push that button — and since the door closes soon anyway, it creates the illusion that they made it happen. 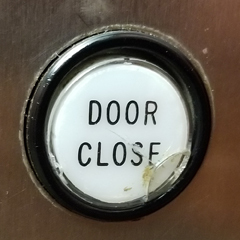 In a world where we have so little control over so many things, believing that you can make the elevator door close qualifies as a minor victory. There, now you know the secret. What will you do with this information? It’s best to just look on quietly when you see people push the door close button. It’s a harmless thing — and an elevator is not the best place to come off as a know-it-all. This entry was posted in Culture, Modern Living. Bookmark the permalink. Next you’ll probably tell me waving two fingers through a stream of cold water doesn’t make it get hot faster. I will continue to push the button! Pushing the button is an expression of faith. It may not work, but it couldn’t hurt. The close buttons on the elevators at 2 Penn Plaza probably don’t work, but the timing of closure is set for New Yorkers – 3 seconds, so it doesn’t matter much. It seems the door open buttons don’t work either. If you’re not interrupting the sensor by hand, that thing is shutting – get out of the way and save yourself. Next you’ll be telling us that the buttons to cross the street don’t work either! Actually, some of them do and some of them don’t — but you never know which are which.